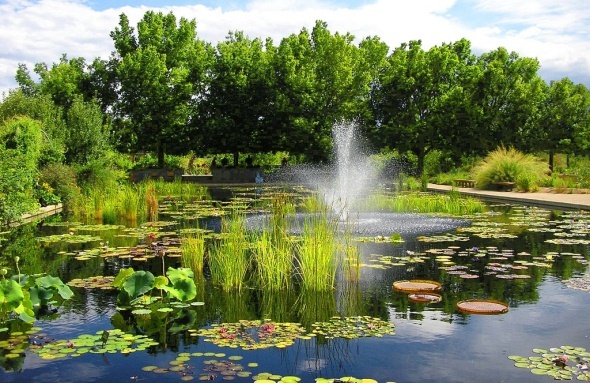 The original Denver Botanic Gardens near Cheesman Park includes 23 acres of theme gardens that take advantage of the high-altitude location to feature cold-weather plants from around the world as well as plants from Colorado and neighboring states. The gardens also have a conservatory with displays of tropical and subtropical plants and an amphitheater that hosts concerts in the summer, plus Denver’s first publicly accessible green roof atop the Offshoots Café. It stages special exhibits throughout the year and a popular Blossoms of Light event in December. The gardens were pioneers in emphasizing native plants and environmentally sustainable practices, such as water conservation and biological control of pests. The gardens and Cheesman Park sit atop the former site of the Mount Prospect Cemetery, whose first burial occurred in 1859 and which was known later as the Denver City Cemetery. Most of the bodies were removed in 1893, but others were not removed until the 1950s and 4,000 remain buried under Cheesman Park’s grass. Woody Allen’s 1973 movie “Sleeper” contained scenes filmed at the gardens. In addition to the main location on York Street, the gardens have a branch near Chatfield Dam in Littleton and a wildflower garden at Mount Goliath west of Denver.